"How can I transfer all my iPad videos to my new iPad? Please help me out!" When you switch to a new iPad, you need to transfer all your valuable data to that brand new device. So, you are changing your old iPad for the new iPad but you don't know how to transfer videos from iPad to iPad. This is where this article comes in. We have compiled a list that provides 5 most effective and proven ways to transfer your valuable data from one iOS device to another, more specifically from one iPad to another. 1. Connect your existing/old iPad and computer with a USB cable. 3. Now, after the computer detects the iPad, click on the iPad icon under the device tab. 4. Select the option "Backup Now", which can be found under "Backup" section of the "Summary" tab. Give some time for the backup to complete. After it is done, disconnect the iPad. 2. Progress similarly as mentioned before and tap on the iPad icon in iTunes. 3. Now, tap on the "Restore Backup"
4. Select which backup you want to use. Lastly, tap on "Continue" and iTunes will start to restore the backup on this iPad. This will help you get access to all your videos on your new iPad instantly. First of all the app is free of cost, and it is available for all platforms. There are no limits when it comes to storing backups in the iTunes cloud storage. The download and transfer speed are very slow. When you create a new backup it will eliminate the older one. Wi-Fi needed for the whole process. 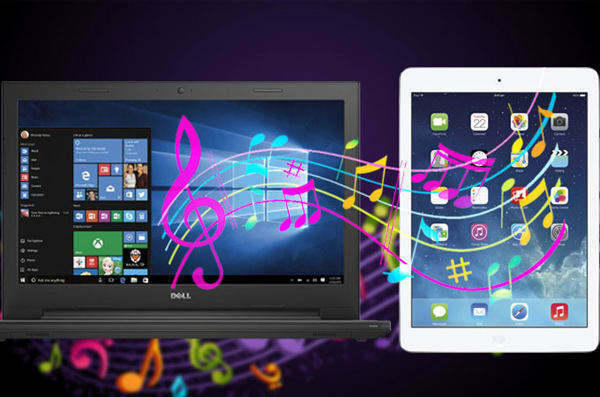 The most common and traditional way to transfer data from iPad to iPad is to use iTunes or iCloud service. There are users who still use iCloud but when it comes to iTunes, these days the app is not very popular. It is mainly due to the fact that the app has become old-fashioned, there are not a lot of options available and it is very slow. Most importantly it crashes sometimes without any reason. Fortunately, there are a lot of other ways to do it. If your goal is to transfer videos between iPads, read the following ways to make it much easier for you. The interface is very simple. The transfer speed is exceptionally fast. Does not rely on iTunes. Selective as well as bulk transfer available. 1. Download and install Tenorshare Phone to Phone Transfer software. 2. Now, launch the software on your computer following the on-screen prompts. 3. Connect both iPads to your computer using two USB cables. 4. After detection, you will see your iPads on the interface with all its information listed. Check the direction of transfer and tap "Next". 5. Select "Videos" option and tap "Start Transfer". All your videos will be sent to your target iPad in no time now! 2. Open "Control Center" on both devices and click on AirDrop and select "Everyone" on the discovery settings. 3. Now, open Photos app on iPad and choose the video files you want to send to your target iPad and then tap on the Share button below. 4. Now, tap on AirDrop under the selected videos and choose the other iPad. 5. Now, take the other iPad and "Accept" the files sent by AirDrop. Always remember that if you are using AirDrop to transfer data then you need to keep both devices in a close proximity, within 30 feet of each other. iCloud is one of the greatest apps Apple has ever created. This app has some wonderful features such as cloud backup, data syncing and photo or media library. So, when it comes to sending large videos from one device to another, iCloud is a viable option thanks to its iCloud Photo Library feature. It basically syncs all your media mainly videos and photos to all connected devices logged in with the same Apple ID. So, if your goal is to transfer video from one iPad to another, here's how to do it with iCloud. 1. On your iPad/iPad Air/iPad Mini/iPad Pro, go to "Settings", enter name and tap "iCloud" to find "Photos". For iOS 10 or earlier, go to "Settings", then "iCloud", then navigate to "Photos & Camera" to find "Photos". 2. 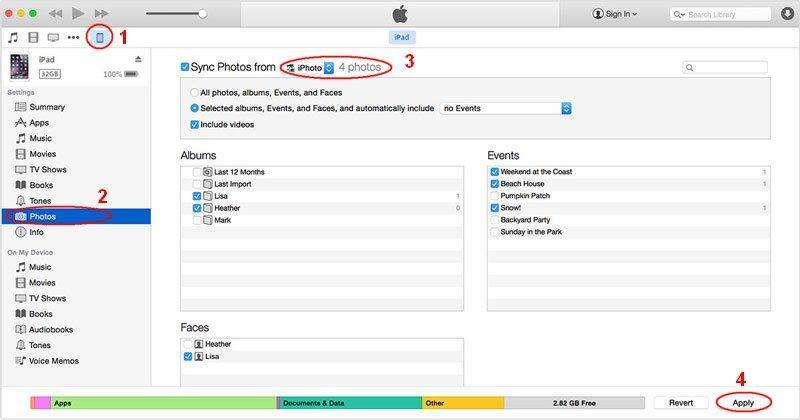 Now, enable "iCloud Photo Library" both your iPads. And that's it! Your videos along with photos will be synced to your target iPad in some time. Email is a genuine option for wireless data transfer. Although this is a very old method, it is safe and secure enough to transfer videos from iPad to iPad. The only thing you need is the email address to transfer data and a good Wi-Fi or cellular data. 1. Open the Photos App on your iPad. 2. Now, select the videos you want to send and tap on the Share button below. 3. Then select the "Mail" option under the chosen videos. Now, get hold of your target iPad and open your email account which you selected earlier. Find the required email and just download the videos from attachment. Even though this method is fast and secure, it is not suitable for transferring large files. It is not practical enough to send a large number of videos as well. All of the apps and methods mentioned in the article are very efficient modes of data transfer between iOS devices. The oldest iOS app iTunes is one of the most popular but now that its popularity has taken a hit due to its poor performance; users are looking for other ways to send video from iPad to iPad or rather overall data transfer. Most of the other apps are also Apple certified and they are good and effective but the third-party app Tenorshare iCareFone takes the prize due to its advantages, the feature list and most importantly its effectiveness. The other apps seemed pale compared to this app on our tests. Highly recommended from our side!